In addition to our weekly studio classes that are accessible to all children, adults, and seniors, Summit Yoga offers private and semi-private classes within our studio or in the privacy of your home or the convenience of your business. No yoga experience is necessary. All you need is a commitment to achieve improvements physically, emotionally and mentally. So why not consider a yoga class during your lunch break or before/after your work day with your friends and colleagues? Or schedule a private class with your adult children? Or purchase a gift certificate for the bride and her bridal party? Summit Yoga invites you to drop-in and experience your first studio class complimentary. Summit Yoga offers workshops for local schools, town employees, girl scouts, PTO and local businesses to introduce the basics and benefits of Hatha Yoga, the physical practice of poses. Workshops are also created to teach breathing exercises/techniques to reduce stress, cultivate relaxation, and leave you with a sense of peace. How about a workshop for elementary teachers to learn about Mindfulness activities for school aged children? Workshops are customized to the group and can include handouts. 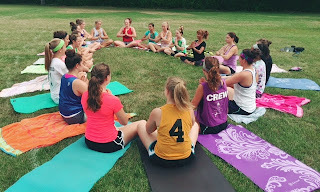 Members of the Milford High School Field Hockey Team practiced yoga together with Laura during pre-season.